Get Rid Of YOUR Unwanted Thoughts & Rituals – FAST! STOP the Obsessions. STOP the Worry. STOP the Repetition. BECOME FREE Again – And Regain Control of Your Mind! An obsession with particular NUMBERS. Twisting the head of a toy all the way round, then having to reverse the twist back to it’s original position. A fear of losing one’s characteristics or personality. Obsessive Compulsive Disorder affects over 3% of the population – and the vast majority are never diagnosed. If so – you really need to read on. For a moment, take a deep breath and relax. My name is Bradley Thompson. I’m a best-selling author of over a dozen books, all focused on the human mind and it’s potential. I’ve spent the past 25 years discovering how fantastic the brain can be. And I also know how PAINFUL it can be – when you’re dealing with obsessive thoughts. How? Because I used to suffer from a deep, surging, painful form of Obsessive Compulsive Disorder that would appear from absolutely nowhere. I would have to perform little rituals that made me feel ashamed, and sad, and literally insane. I would also obsess about certain symbols. And I had to keep doing little patterns with my hands until I felt “clean” and “whole” and “right” again. Other people simply didn’t understand. And how could I possibly explain it to them? That’s when I got involved in psychology. I spent years researching Obsessive Compulsive Disorder and how it came about. That was the past but it's different now. A solution that allows you to take back control of your mind – and begin acting in the precise way that YOU want to! A solution that does NOT involve psychologists or psychiatrists, doctors or drugs. To Put An END to Your OCD, STARTING TODAY! Over 3% of the population currently suffer from Obsessive Compulsive Disorder, and the vast majority are never diagnosed - often due to the shame of admitting such problems to a doctor. If not, then I’d like to share something with you. It’s my brand new, easily-accessible guide to getting rid of OCD – with the latest cutting edge psychological research. Recent research into obsessive rituals and thought suppression means that you can now control your OWN thoughts, from the comfort of your OWN home WITH THE RIGHT TOOLS. There’s no need to feel shameful about speaking with a psychologist. There’s no need to feel desperate, or embarrassed, or insane. Just follow a simple, step-by-step plan – along with a few simple exercises - and you’ll be on your way to true FREEDOM from unwanted thoughts and obsessions. I really, REALLY want you to discover how it feels to be WITHOUT Obsessive Compulsive Disorder. You simply won’t be able to BELIEVE the freedom. It'll feel like a HUGE WEIGHT has been lifted from your shoulders. ONCE and for ALL. And inside my 35+ page guide – “Stop OCD” – I’ve compiled absolutely EVERYTHING you need to know to get rid of those obsessive rituals Starting TODAY. No more shameful, bad, extreme thoughts. No more obsessing about the future. No more triple checking everything before you leave the house. Discover the PRECISE Reasons WHY You Have OCD – I’ll show you how it first appeared, and what you can do about it in future! How Doctors Are TREATING OCD Today – From medicine to behaviour therapy to dangerous psychosurgery, and how it can make things WORSE! Why Giving Your Unwanted Thoughts MORE ATTENTION Could Actually Help – It seems crazy, but follow my technique and see the difference! The FIVE-STEP TECHNIQUE for CRUSHING Your OCD – Discover the ultimate five-step method for STOPPING your obsessions! ELEVEN POWERFUL “RELEASING” METHODS to Get Rid of OCD – Possibly the most powerful tricks for getting rid of ALL bad thoughts and obsessions! I’ll send you my ultimate 35+ page guide to getting rid of Obsessive Compulsive Disorder, once and for all. It’s based on the latest in scientific and psychological research, covering the powerful five-step method for crushing unwanted obsessions FAST! Includes eleven powerfu “releasing” techniques. Got questions? Need assistance with any part of the program? Don’t worry! Our team are on-hand to help you through any issues you might experience. That’s what we’re here for! Discover my three-hour audio program for taking control of your thoughts and feelings. Don’t feel overwhelmed by the world around you. Let me share my techniques with you! Sit back and relax with my three-hour audio course on making the most out of your life! Learn to love everything you have in your life today – and keep discovering how to live more in the now. Try out the entire course for three whole months! It’ll absolutely CHANGE your life, and crush any unwanted obsessions you may have. If you aren’t entirely thrilled in any way whatsoever, I’ll personally refund every penny you paid! So, would YOU like to crush your OCD and start ENJOYING the ultimate FREEDOM? Remember My 100% No-Questions-Asked GUARANTEE! I 100% GUARANTEE THIS will help you FINALLY be FREE of obsessive thoughts and rituals! I’ve poured years of knowledge, research and personal experience into creating this guide. It’s the first easily accessible guide of its type – intended for real people, and not elitist reading for the psychological community. I’m so CONVINCED that you’ll be THRILLED with this guide – and that it’ll help you crush ALL of your obsessive thoughts – that I’m putting my money where my mouth is. Try out the ENTIRE GUIDE for THREE WHOLE MONTHS – and just see the difference! If you aren’t absolutely overwhelmed by the way this guide turns your life around, just let me know after three months (and before four months is up) – and I’ll personally refund every penny you paid. Not only that, but this guarantee is backed by my publishers – the Self Development Network – so you can be assured that your money is safe. PLUS – SPECIAL FRIDAY BONUS! 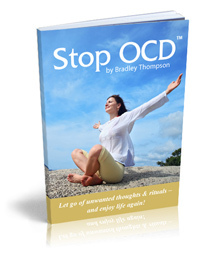 In addition, if you purchase the entire “Stop OCD” package TODAY, I’ll also send you two FREE EXCITING BONUSES. You’ll receive two of my most popular audio courses, worth over $79 each, at NO COST! I’ll be sending you “How to Command & Master Your Emotions” – my ultimate three-hour audio course on taking control of your thoughts and feelings, and being happy no matter what happens in your daily life. I’d also like to give you “How to Live a Longer & Happier Life,” my second three-hour audio course on making the most out of life, by learning to live in the now and becoming happier with the world around you. You’ll never, EVER regret making this decision. I promise that you’ll be experiencing the ultimate in freedom – in just days from now. You’ll be a changed person and won’t be able to believe the shift! There’s a reason you ended up at this website. I invite you to click the button above, take control once again - and discover that reason for yourself! PPS. Remember, this is the BEST PRICE I’ve ever offered this package! THIS WORKS and I could be trying to squeeze every last penny out of the 3% of people who suffer from this condition. But I believe in karma – what you give out, comes back to you. Don’t forget: If you’re not 100% thrilled, I’ll refund every penny you paid! That’s how much I believe that this guide will really help you cast aside all of your unwanted thoughts. The feeling of freedom you’ll be experiencing just days from now is awesome. I know, I’ve been there. Now it’s your turn. 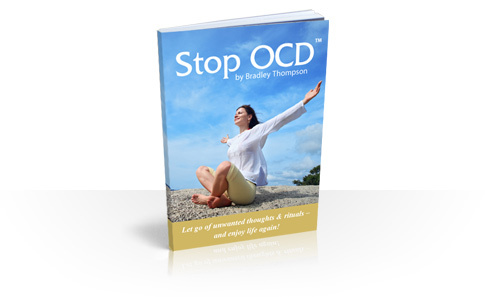 Click HERE to grab your copy of “Stop OCD”!